STEM is an acronym for Science, Technology, Engineering and Math education, fields that are deeply intertwined in the real world. STEAM incorporates the “A” for the arts because to be successful in technical fields, individuals must also be creative and use critical thinking skills, which are developed through exposure to the arts. Monday, April 22 • 2-2:45 p.m.
Read a story and learn how seeds germinate and plant your own to take home. Sign up here. Tuesday, May 14 • 4 p.m.
Thursday, June 27 • 2:30 p.m. Build your own fun with Legos, Snap Circuits, K’nex, blocks, puzzles, origami and more. For kids and families. Saturday, June 1 • 3 p.m.
Our “eggsperiment “ begins! Meet a chicken and rooster with environmental educator George Steele and learn how the library eggs will incubate. Sunday, June 9 • 3 p.m.
What’s going on in our eggs? Learn about embryo development as we candle our eggs and predict how many will hatch. The library offers preschool math and STEM programs, which combine stories with STEM-related activities. One popular “number eggs” from a past program can be easily reproduced at home. Take a bag full of plastic eggs – the kind that come apart in two pieces – and label them with a permanent marker. 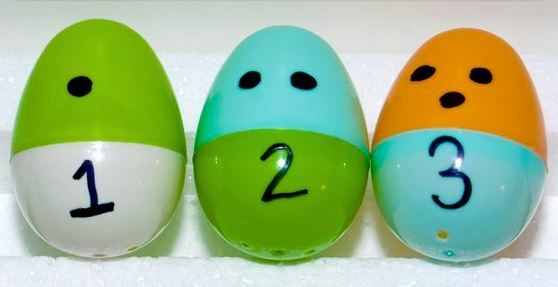 One half of the egg should be labeled with the numeral while the other half of the egg should have dots drawn on to represent that number. Have your child find the corresponding halves. You can see how easily this technique can be adapted for addition and subtraction, or even analog/digital timekeeping! Engineering programs are great fun, and our young patrons have built spaghetti and marshmallow towers, paper bridges and straw bridges in order to explore how different materials and building designs work. Other STEM programming includes our Lego Club, Family Build Nights and 3D printer programs. The library provides access and hands-on instruction to popular and innovative technology including 3D puzzles, Legos, Lego WeDo, Ozobots and more. This provides a great foundation in many STEM concepts. Check out our teen STEAM page here.